And it feels so good, it’s like walking on glass. I don’t typically look to ‘90s experimental funk rap metal bands to summarize a year of my life, but in this case I’ll happily make an exception. 2014 was an epic year that flew by in a flash… and what’s a blog for if not to document epic-osity? 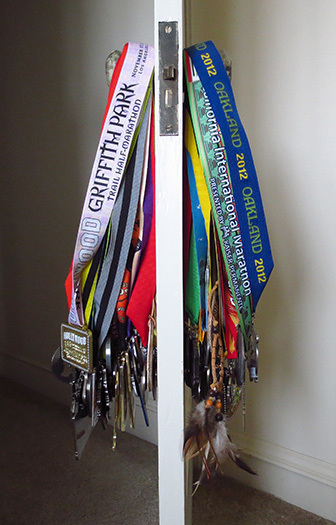 1) The new year was still in its infancy when I tackled my first challenge of the year, running back-to-back (meaning consecutive days, not consecutive weeks) marathons in the Deep South, at the Mississippi Blues Marathon (in Jackson, MS) and the First Light Marathon (in Mobile, AL). I finished both marathons in sub-3:45 and even qualified as a Marathon Maniac at the “Iridium” level (maniac #9273, if you’re counting). All of this despite some discomforting race-day gastrointestinal hijinks, courtesy of the pre-race pasta dinner in Mobile. Note to anyone running the First Light Marathon in nine days: given that I’m still awaiting an explanation from the Alabama Department of Public Health (hey guys, what’s the poop? ), you may want to consider the local Olive Garden for your pre-race carbo load. 2) Responding to my brother’s challenge in March, I broke 20 minutes in my first-ever 5K race, winning the monthly Boeing 5K in nearby Seal Beach in 19:53. I was walking on sunshine after that race, even running eight more miles home from Manhattan Beach later that day. 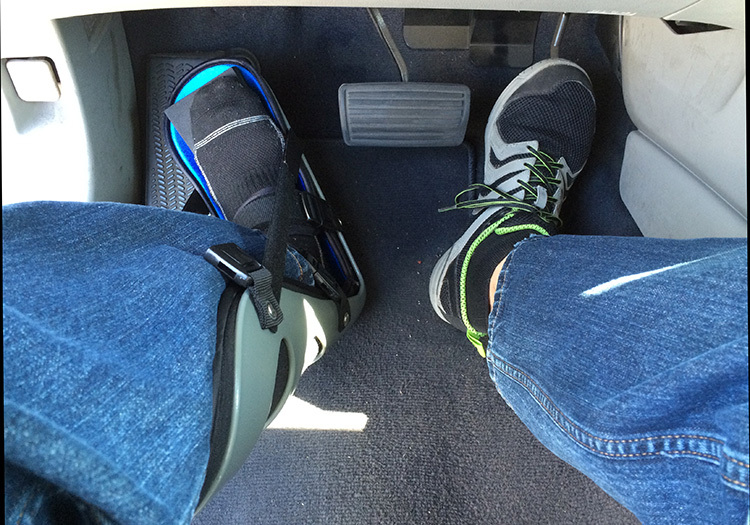 All was right in my running world… until suddenly it wasn’t. 3) Because then I got injured, developing a sudden case of that-which-must-not-be-named-iitis. “Plantar fasciitis” is second only to “stress fracture” among two-word phrases that make healthy runners burst into tears. For a while I tried to push through the nagging heel pain, even managing a satisfying sub-4:00 at the Big Sur International Marathon – though my heel would have its revenge in the days following the race. Unfortunately, with no idea as to what had caused my PF in the first place, and thanks to a wealth of shockingly uninformed professional advice, I soon found myself lamenting (cue George Michael) I’m never gonna run again, achy feet have got no rhythm…. Luckily I found Doris, a physical therapist apparently sent by the running gods, who in short order prescribed a regimen of stretching and strengthening that completely cured my PF within a month. Now in retrospect, after seven months of pain-free running, I’ll urge all PF-stricken runners one more time: before you numb your heel with ice and ibuprofen, before you order custom orthotics or switch to massively cushioned shoes, and before you consider expensive treatment options, please do yourself a favor and give Doris’ regimen a shot. 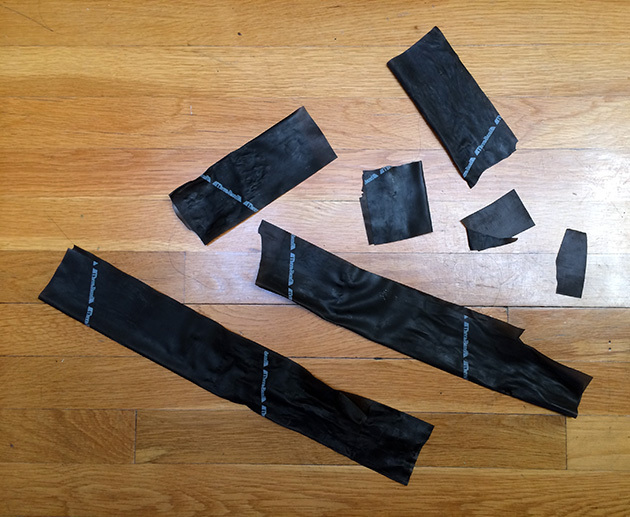 I’m not promising it will be your sure-fire cure as it was for me – but it just might, and full recovery may be just a Thera-Band away. For those who have spent weeks, months or even years waking up every morning unable to put any weight on their heel, this “too good to be true” therapy may actually be both. 4) Coming on the heels of my plantar fasciitis, I got faster – in my next marathon in Berlin, I set my current marathon PR of 3:24:14, and in the process knocked 4:31 off my previous PR. I followed this up with a 3:32:04 at the New York City Marathon and an oh-so-close 3:24:15 at the California International Marathon, closing out 2014 with three of my five fastest marathons in a span of 71 days. 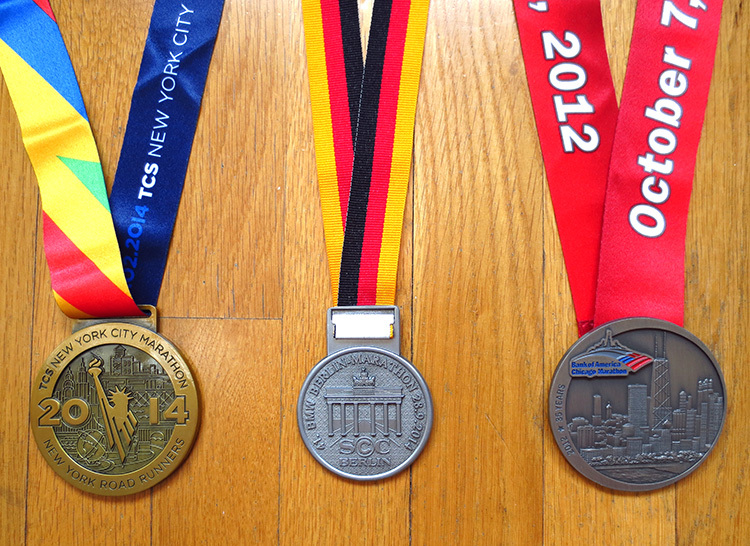 5) Two of those three fastest marathons came as I ran dual World Marathon Majors in Berlin (on the world’s fastest course) and New York City (in the world’s biggest party). Most runners (including me) would consider themselves crazy lucky to be able to run one WMM in a year, so being able to run two on opposite sides of the Atlantic was appropriately epic. For those of you keeping score at home that’s three Majors down (including Chicago), three to go. Boston, I’m coming for you. 6) As the cherry atop my 2014 racing sundae, I qualified for Boston twice, at both Berlin and CIM. Unfortunately, thanks to the Boston Athletic Association’s nebulous new “maybe you did, maybe you didn’t” qualifying standards, past performance is no guarantee of future results. So I’ll have to wait until September to know for sure whether I’ll be lining up in Hopkinton in 2016. In the meantime, I’ll use the intervening eight months to try to nail down a more convincing BQ. 7) Like the immovable object meeting the irresistible force, my pre- and post-pubescent lives collided head-on in November when I ran the Disney Avengers Super Heroes Half Marathon. I’m still finding time to chronicle the experience… though I’m probably Goofy to think that will happen before my next Disney race in nine days. 8) Following through on 2013’s year-end promise of a new project filling the space between races, Katie and I launched a new online community based on our shared passion for running. RaceRaves.com is a resource that enables runners (and running bloggers!) of all levels, distances and terrains to find, discover, rate, review and organize races around the world. The site has only been public for a month, but we’re psyched by the positive response it’s gotten already, and we can’t wait to keep improving and evolving. Plus, two PRs (that I know of) were set by runners wearing RaceRaves t-shirts in 2014, and I think it’s safe to assume that can’t be simple coincidence. So please keep those raves and referrals coming in 2015 – we couldn’t do this without your support! 9) This one has nothing to do with me, but nobody in 2014 defined “epic” more than 38-year-old Meb Keflezighi, who pulled away from the lead pack and held off a late charge from Wilson Chebet of Kenya to become the first American to win the Boston Marathon since Greg Meyer in 1983. In a year where no American cracked the top 100 fastest marathon times, Meb’s triumph allowed everyone associated with American running to stand tall for at least one Patriots’ Day. In my own living room, watching Meb break the tape, don the laurel wreath of the victor and wrap himself in the Stars & Stripes – while dedicating it all to the people of Boston – gave me my most inspired case of runaway goosebumps since I-can’t-remember-when. 10) Best of all, thanks to my running trinity of racing, raving and blogging, I renewed old friendships while building new ones, in the U.S. and abroad. The core attitude behind RaceRaves is reflected in the Christopher McDougall quote on our home page: “The reason we race isn’t so much to beat each other… but to be with each other.” From Boeing to Big Sur to Berlin – and despite the endless solitary hours spent training on the track and along the beach – Katie and I are very fortunate to be able to practice what we preach. Bottom line: neither personal bests nor glorious bonks mean a whole lot without others to share them with. My “Go far, go fast” mindset will continue to evolve in 2015. I’ve got my sights set on my first 50-miler, though I’d like to improve my marathon PR before that happens. And after an entire year of nothing but road races, I need to get back on the trails, pronto. Other than that, with no World Marathon Majors or other high-profile events demanding a commitment months in advance, I’m looking forward to a more spontaneous racing schedule than 2014. So if you’ve got something epic in mind, let me know and I just may join you! And while I refuse to label this a resolution, I may even work on getting my race reports under 10,000 words each. 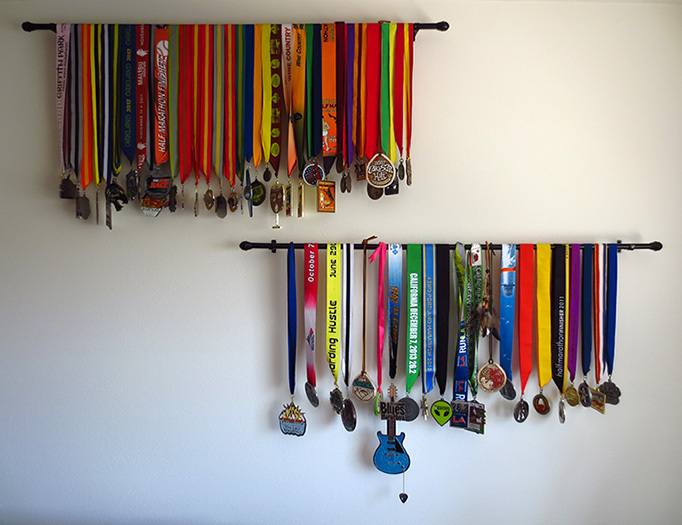 Hope you conquer all your running goals and make 2015 your own epic year, filled (of course) with Blisters, Cramps & Heaves. Run strong and rave on!